Waiting in the Jungle Theater lobby for the house to open at The World Goes 'Round*, I overheard two patrons discussing changes in the local theater scene, including Sarah Bellamy's becoming the artistic director at Penumbra Theatre. And this is what they said: "She's so light-skinned--you'd never guess she was ... (slightly lower tones) African-American." Really. Issues of race and racial equity are in the forefront of every sphere of life and culture right now. MPR's Marianne Combs recently hosted a fascinating discussion with Randy Reyes of Mu Performing Arts, Toni Pierce-Sands of TU Dance, and C. Michael-jon Pease of Park Square Theatre about the future of diversity (racial and cultural) in Minnesota arts and how to bring people of color into theater audiences. Ten Thousand Things Theater's Ambassador Program works specifically to bring in audiences of color to their paid shows. With issues like this in mind, I tend to scan theater audiences for their demographic make-up and seeing how well people of color are represented in the audience. As many audiences at shows I attend are primarily older, and pretty darn white, I love to see an audience with representation across the board. For example, I was so pleased by how racially (and age) diverse the audience was at The Color Purple at Park Square Theatre. #Representation rocks. And representation rocks not only in the audience, but on stage as well. One of the reasons it was so great to see a racially diverse audience at The Color Purple was that the stage was filled with fabulous actors of diverse racial backgrounds. There's something about an all-white audience viewing a show made up of actors of color (particularly singing) that smacks of white privilege and makes me uncomfortable. What can I say? These issues are challenging, sensitive and very personal. 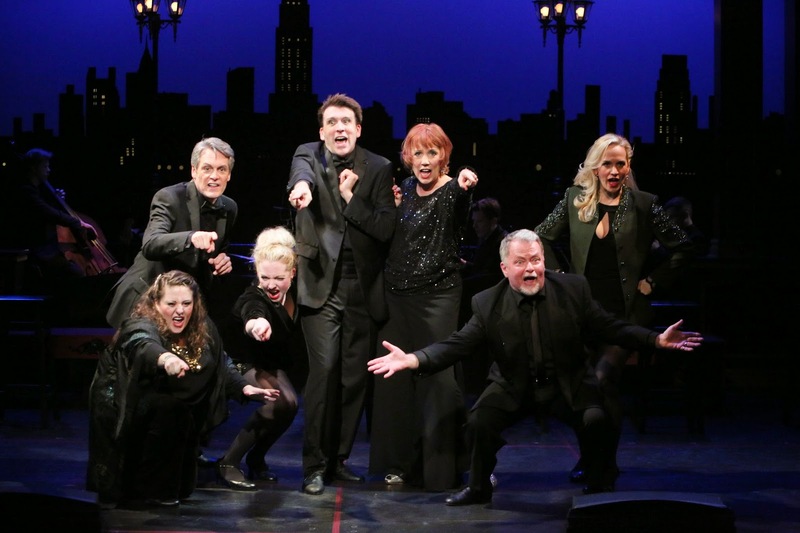 The World Goes 'Round (at the Jungle Theater now through May 24), a revue of the songs of John Kander and Fred Ebb, was conceived by Scott Ellis, Susan Stroman and David Thompson and originally performed in the early 1990s. It's hard to look at the Jungle's production of this show, which is a revue and contains material from twenty-six years of musical collaboration, and not see any representation by actors (or musicians) of color. The band is made up of seven white men, and the cast of three men and four women is uniformly white. There's nothing wrong with an all-white cast, but when so many perceived barriers to non-traditional casting involve the 'jarring departure from reality' of casting siblings of different races or casting actors of color in positions of power in historical times, shouldn't a revue be easy to cast with at least a little non-traditionality? I'm hoping Lin-Manuel Miranda's critically praised and wildly successful musical Hamilton, in New York now and transferring soon to Broadway, will help pound a nail in the coffin of those arguments to diverse casting. The songbook revue is both the easiest and the hardest type of theatrical show to pull off. "Easiest" because you seemingly just throw together a bunch of songs and let the audience revel in waves of nostalgia. "Hardest" because, if you don't want the audience tuning out after the first few numbers, you need to come up with some kind of through line or production concept to hold people's attention. Yes. And a revue plucks the song from its context in its musical and asks the performers to sell a story through that song. If you'd like to see the revue done beautifully, don't miss the Broadway Songbook series at the Ordway. Hosted by James A. Rocco and written by James A. Rocco and Jeffrey P. Scott, the Songbook focuses on a songwriting team, an era or a particular style. Featuring a revolving cast of talented performers (including performers of color), the cast sells the hell out of the songs. Next up is Broadway Songbook: Rock & Roll on Broadway (April 17-18). With their great affection for the genre and amazing performers, these shows are necessary viewing for any musical theater fan. I've listened to the 1991 Original Cast recording of And the World Goes Round (which features five actors including Karen Ziemba, Jim Walton, and Brenda Pressley--who happens to be an actor of color), and despite the best intentions and talent, I don't think it's a very successful show. Starting with an overwrought "The World Goes 'Round" from New York, New York, moving on to a frenetic "Coffee in a Cardboard Cup" from 70, Girls, 70, this revue maintains an exhausting heightened emotional state. It's all hills and no valleys. The new arrangement of "Cabaret" (think Manhattan Transfer on the Lawrence Welk Show) and the closing version of "New York, New York" (sung in a number of languages) just don't work for me. With all this said, the cast of the Jungle Theater production performed gamely and with great commitment. They worked hard to sell the songs, and I wish the show had served them better, particularly Bradley Greenwald (impeccable as always) and Emily Rose Skinner (a great comedienne who made the most of the intimacy of the Jungle). But there's no way around this: the show is way too loud. The on-stage band is miked, the performers have both body mikes and handheld mikes (with obvious sweetening), and it is LOUD. The sound, combined with the unnerving tendency for the performers to aim over the audience's head to balconies that don't actually exist, made me feel that the show was staged for a much larger venue. (Say, Bloomington Civic Theater?) One of the things that I have always loved best about the Jungle is its warm intimacy, and it's a shame to be blasted out of that lovely space. I wonder if the loudness of the show (and the revue format) contributed to one of the strangest experiences I've had in the theater. After each number, audience members (a few--let's not get crazy) whistled shrilly (as if they were at a rock concert), and if a cast member did some sort of move, there was woooooooo-ing. It was really odd, and perhaps contributed to the actors' energy and intensity being turned up to eleven. Possibly twelve. * So what's the actual title? The program reads "And the World Goes Round", while the website lists the show as "The World Goes 'Round." According to Peter Filichia at MTI, the surviving creators prefer the latter, and that's how MTI licenses it. So that's what I'm calling it!